Fog leads to the most fatalities compared to any other weather phenomenon in the Central Valley. (Shutterstock Photo). Imperative indeed, especially since fog leads to the most fatalities compared to any other weather phenomenon in the Central Valley, said Kris Mattarochia at a news conference Wednesday morning. In 2007, a 108 vehicle pileup killed two and injured 41 others on Highway 99 south of Fresno. Just last year, there was a 40-vehicle pileup on Highway 198 in Kings County that injured 12. “We take that very seriously,” said Mattarochia, the science and operations officer for the National Weather Service in Hanford. To show how seriously, the NWS has developed what it calls the Fog Severity Index. The daily index ranges from 1 to 5, with 5 being the most severe. The data is available on the NWSwebsite. 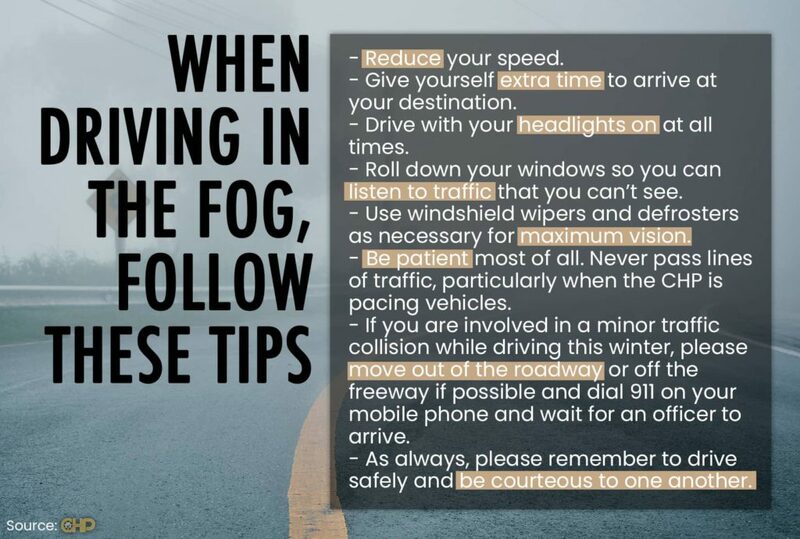 Caltrans, together with CHP and the National Weather Service Hanford, offered tips on driving in fog Wednesday morning. The index, Mattarochia said, will pair with NWS’s Dense Fog Advisories. They will alert motorists several hours in advance of the worst Valley fog events. Motorists will see some of the messages on changeable message signs on their drive home from work during rush hour, Mattarochia said. He said the signs will warn about dangerous visibility that may be possible on commutes the next day. “This will help you plan your next day with regards to any travel delays or possible school delays,” Mattarochia said. To help keep the motoring public safe when the weather turns for the worse, Caltrans has developed several advanced warning systems. Along a portion of Highway 99 in Fresno and Tulare counties is a network of sensors and monitors that measure visibility and detect speeds and traffic volumes, Ehlert said. These sensors, Ehlert said, are connected to a wireless message sign. She said the signs will automatically warn drivers if it detects low visibility or slow traffic. “This fog detection warning system continues to help us be more efficient in communicating and responding to roadway conditions in real time,” Ehlert said. Caltrans also has Operation Snowflake — an advanced warning system for the Grapevine on I-5. 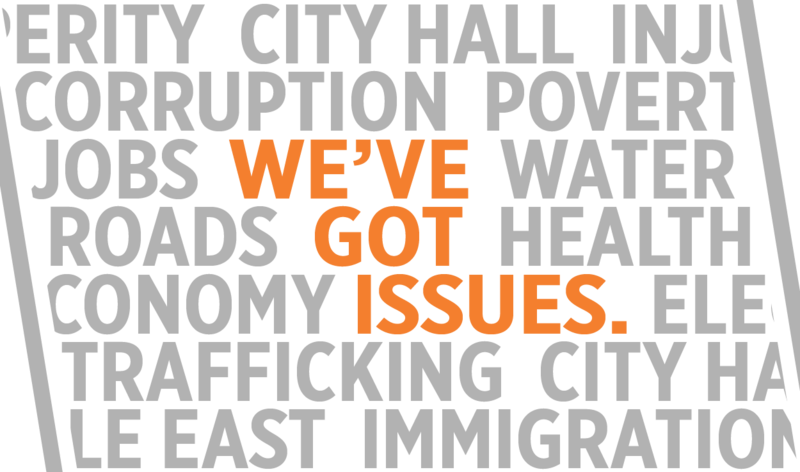 Caltrans developed the program in cooperation with the California Highway Patrol. “There are three phases of Operation Snowflake, the third being the point at which the Grapevine is deemed unsafe to travel and we have to shut it down,” Ehlert said. Another way the public can learn about roadway conditions is via QuickMap — a Caltrans app available for smartphones. “It is a very useful navigational tool that features real time traffic updates and incidents, and road closures,” Ehlert said. Caltrans is also widening the striping on the state highway system from 4 inches to 6 inches, Ehlert said. The stripes feature a new type of paint embedded with reflective beads. “This undertaking will help motorists a great deal in the fog,” Ehlert said. The Road Repair Accountability Act of 2017 — commonly known as the “gas tax hike” — is the funding source. The CHP will pace traffic when fog visibility becomes less than 500 feet. 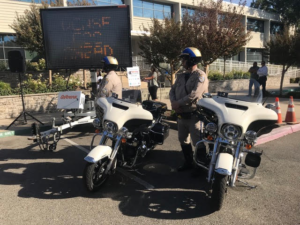 “Our pacing efforts are conducted to ensure the motoring public travels at a safe speed while escorted through dangerous weather conditions,” said Jesse Holguin an assistant chief with CHP. Costa Said He Doesn’t Support Pelosi for Speaker. How Will He Vote?